Do you know someone who loves animals or has a very special pet in their life? Have you been wondering what to give them as a gift for their birthday, Christmas or perhaps just to make them feel special and brighten up their day? At Pets in Watercolor we think we might have just the gifts that tick the boxes for you. For some people, their dogs become an integral part of the family, loved and treated like any other member of the family (sometimes more so). They know when you are happy or sad and are always there to listen to you and give their canine views on the subject. So why not give them a beautiful watercolor image of their own dog printed onto various products with a personalised message from Pets in Watercolor? Printed in vivid full color onto high quality mugs, phone covers and other gift ideas, they make the perfect gift for those special people in your life and are available from our on-line store. 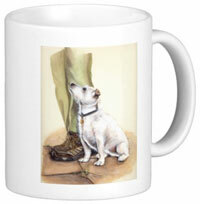 On the reverse of the mug there is a printed special message, proverb or some breed information. Or why not personalise the gift even more and add your own message? Do You Have a Specific Dog Breed in Mind? Then why not visit our section of different breeds of dogs to see if it's the dog that you are maybe enthusiastically greeted by every time you visit your friend's house. You'll find some details and breed information about the dogs and maybe recognise the traits of the dog in question.